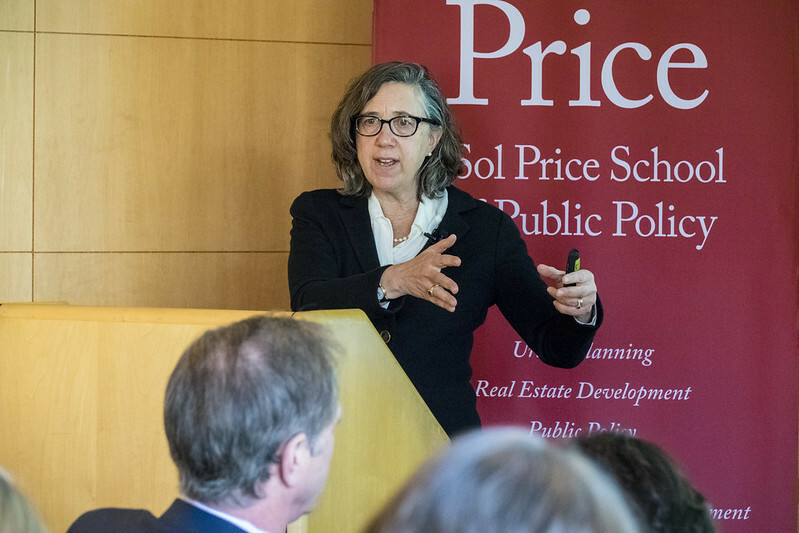 Ray Madoff, a professor at the Boston College Law School, spoke at the USC Price School of Public Policy on Feb. 1 about tax policy, nonprofits and philanthropy, and why charities are panicked in the wake of the 2017 tax reform. Madoff is the co-founder and director of the Boston College Law School Forum on Philanthropy and the Public Good, a nonprofit think tank that convenes scholars and practitioners to explore the rules governing the charitable sector. “My goal today is to talk about the central role tax rules have played in shaping and creating our philanthropic and nonprofit sector,” Madoff said. Madoff presented that many countries throughout the world fund central aspects of society – such as education, health care, housing, social services, food banks, scientific research, museums and symphonies – directly through the government. People pay taxes and the government decides how to allocate resources. In the United States, much of the financing for such social ventures comes from private sector donations. The federal government acts as a silent partner encouraging that charitable giving through tax benefits. The connection between tax law and the charitable sector began with the creation of the estate tax in 1916 and income tax in 1917. Those tax systems allowed a subsidy for tax payers who chose to give to charitable organizations. These subsidies were central in fueling the country’s impressive charitable sector. In 1969, Congress revamped the tax rules by making separate categories for public and private foundations, with private foundations getting lesser tax benefits. This provided fertile soil for the eventual rise of Donor Advised Funds (DAFs). In 1991, financial institutions realized they could start their own public charities to hold people’s donations, and provide maximum tax benefits and minimum disclosure requirements. These DAF sponsors qualify as public foundations by receiving at least one-third of their support from individuals that give less than 2 percent of the organization’s total support. It’s a loophole allowing people the tax benefits of charitable giving while setting aside the money in a fund from which they can make gifts over time. As a result, Fidelity Charitable Gift Fund received the most donations of any charity last year. Madoff asserted that the 2017 tax bill accelerated the value of DAFs, because DAFs provide double tax benefits for contributions of complex assets and facilitate the bunching of donations, making it more likely for the donor’s contributions to exceed the standard deduction. About a hundred years have passed since the establishment of the tax system that favored charitable giving, and 50 years since it was overhauled. Now, Madoff thinks it’s time for another significant reform — which would close DAF loopholes by imposing time limitations on the usage of DAF funds to ensure that the money will eventually be committed to charity, and by disallowing foundations from using DAFs to meet the five-percent payout requirement. However, she contends that reform is a difficult proposition due to the power and influence of the financial institutions profiting from DAFs. She mentioned talking to a group of nonprofit leaders about how they were being hurt by the tax rules, but facing resistance because the nonprofits don’t want to alienate their wealthy donors.